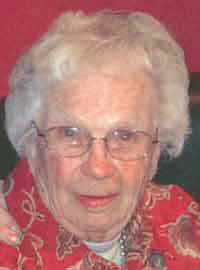 Jane Matkins, 91, of Fort Collins, Colo., and former longtime resident of Pocatello, Idaho, passed away on March 16, 2013. She was born in Mud Lake, Idaho, on Jan. 12, 1922. She graduated from Roberts High School and furthered her education at Idaho State University. She worked for First Security Bank for 25 years. She belonged to Radiant Chapter 61, OES and the Bannock County Historical Society. She also served for 12 years on the Planning and Zoning Commission in Pocatello. She loved gardening and cooking. She is survived by a daughter, Caroline (Patrick) McCluskey of Fort Collins, Colo., and a son, John (Carol) Matkins of Ketchum, Idaho. She has four grandchildren and four great-grandchildren. She donated her body to medical science and at her request, there will be no service. Memorials may be given to Pathways Hospice, 305 Carpenter Rd., Fort Collins, CO 80525. You may sign the guestbook at www.VesseyFuneralService.com.